The measures most widely used in Lancashire, according to Smith, were either 21 feet or 24 feet, with the former favoured north of the Ribble and the latter to the south. In Preston, the 1774 plan of the town and the survey which it illustrated, produced by George Lang specify a pole of seven yards, and a de Hoghton deed of 1535 does the same, specifying a rod of 21 feet to measure land in the town: both conforming to the ‘rule’, and meaning that a de Hoghton or Lang acre is equivalent to 1.62 statute acres. This measure was still in use into the 19th century, as witness a plan of William Atherton’s Preston estate dated 1813 which specifies a pole of seven yards. There is a copy of this plan on Flickr (https://www.flickr.com/photos/rpsmithbarney/20879909855/) which is not sourced but probably relates to the Atherton map at Lancashire Archives. And when William Cartwright was carrying out a survey for the proposed canal basin in Preston in 1801 he specified a perch of seven yards as is shown on a copy of his plan in the map drawers at Preston’s Harris Reference Library. 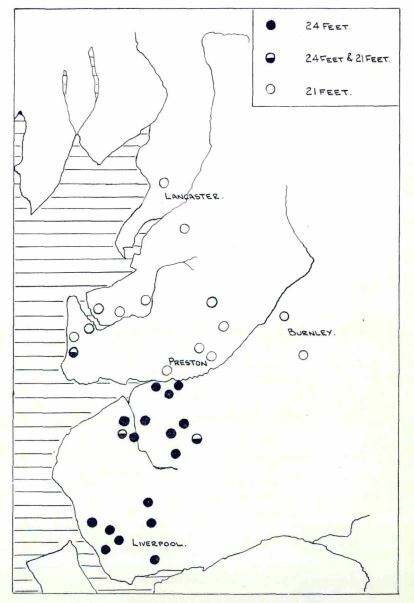 E.H. Smith, ‘Lancashire Long Measure’, Transactions of the Historic Society of Lancashire and Cheshire 110 (1958), http://hslc.urwindigital.com/journal/vol-110-1958/attachment/110-2-smith/. E.H. Smith, ‘Lancashire Long Measure – Uploaded Article’, n.d., http://www.hslc.org.uk/wp-content/uploads/2017/05/110-2-Smith.pdf. J. H. Lumby, ed., A Calendar of the Deeds and Papers in the Possession of Sir James de Hoghton, Bart., of Hoghton Tower Lancashire (Record Soc. of Lancs. & Ches, 1936), Deed No 342. ‘Map of an Estate in Preston Belonging to William Atherton, Esq’, 1813, RDLa/23/1, Lancashire Archives. ‘Porter’s Ribble Plan’, 1756, DDPR/144/7, Lancashire Archives. Mary Bateson, ‘Review of The Chartulary of Cockersand Abbey, of the Premonstratensian Order by William Farrer’, The English Historical Review 17, no. 65 (1 January 1902): 152. Smith, ‘Lancashire Long Measure – Uploaded Article’, 10–11.